Martha Crone begins her 25th year as Garden Curator and the Garden enters its 51st year. NOTE on photos: From 1948 to 1957 Martha Crone assembled a collection of Kodachrome slides that she took of plants and landscape of the Wildflower Garden. The assemblage eventually totaled over 4,000 slides. She used these slides to give illustrated lectures about the Garden to various clubs, groups and organizations. Martha Crone was a founding member of The Friends of the Wild Flower Garden, a director from 1952 to 1972 and an honorary life member thereafter. After her death in 1989 her daughter Janet, passed the collection to the Friends via Friends member Martha Hellander who was in the process of researching a book about Eloise Butler. The Friends sorted the collection and then for a short time, used them at lectures about the Garden. Some of those images are shown on this page. 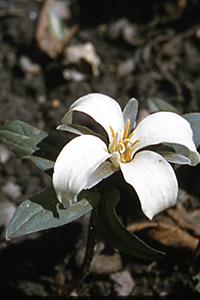 A rare 4-petaled Snow Trillium, photographed in the Garden on April 22, 1957 by Martha Crone. The Snow Trillium is usually the first spring flower. She reviewed the culture of growing ferns and where to plant various types of ferns, all of which species she was currently planting the in the new Fern Glen established the prior year. Friends President Clinton Odell wrote about the Achievement in Horticulture Medal Martha had received the previous Autumn from the Minnesota Horticultural Society. The Friends held their annual meeting on Wednesday Jan. 2, 1957 at the offices of the Burma Vita Company at 2318 Chestnut Ave. West, in Minneapolis. Elected to the Board of Directors were: Russell Bennett, Earle Brown, Dorothy Binder, Elizabeth Carpenter, Martha Crone, Donald C. Dayton, Clinton Odell, Leonard Ramberg, Carl Rawson, Mrs. Clarence (Edda) Tolg. It was voted to give $500 to the Board of Park Commissioners to assist in maintenance of the Wild Flower Garden. December of 1956 and January of 1957 were mild as Martha Crone noted in her log (1) and with a lack of snow. she also noted that Sparrows were bathing in pools of water after a rain. A view of the path in Marsh with Marsh Marigolds, photographed on May 7, 1957 by Martha Crone. Click on image for a wider and larger view. On April 3 she noted her first planting of the year - 50 white Mertensia in various places from Mrs. Knudsen in Springfield Ill. Snowed under the next day with 7 inches. 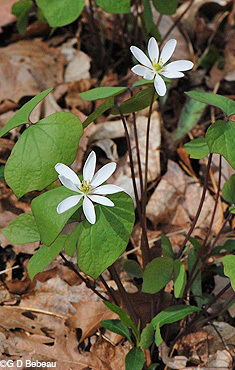 Twinleaf (Jeffersonia diphylla), Photo ©G D Bebeau. Martha noted the publication of a book by Edith Schussler about early life in Montana - “Doctors, Dynamite and Dogs.” Mrs Schussler was an early pupil and a friend of Eloise Butler. She is pictured in the group photo at Eloise’s 80th birthday party in 1931 and and she was also of friend of Martha’s. A letter to Martha from Edith is noted in the 1939 history. Asarum shuttleworthii [Hexastylis shuttleworthii var shuttleworthii] Largflower Heartleaf, not native, from Three Laurels Nursery, Marshall NC. Diospyros virginiana, Common Persimmon, not native, same source. She just listed it as “persimmon” so we assume it was the common variety. Jeffersonia diphylla, Twinleaf, native, 3 plants. planted south of office which may be the place where they still grow today; from Mr. Johnson of the University of Minnesota. 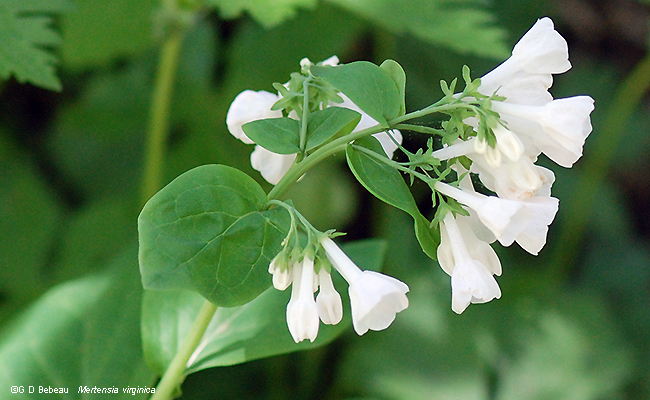 Below: White Mertensia, (Mertensia virginica). Martha Crone planted 25 of them in 1957. Photo G D Bebeau. 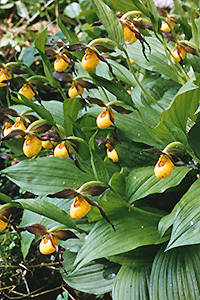 The Yellow Lady's-slipper (Cypripedium parviflorum var. makasin ) in bloom in the Garden, photographed on June 6, 1957 by Martha Crone. Click on image for a larger version. During the Summer, just outside the Garden, the Park Board built a water diversion pipeline that ran from Bassett’s Creek to Brownie Lake and was to be used to add water to the Chain of Lakes when necessary. Pumping began immediately in 1958. 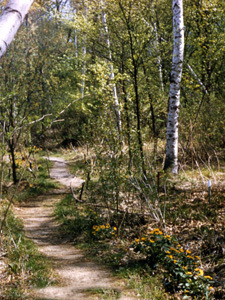 The line bisects that boggy area between the picnic grounds and the Garden on the north, then follows a pathway toward Birch Pond on the west side of where the Garden is. 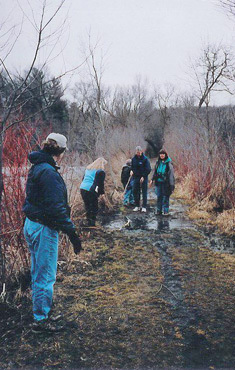 The gravel path through that boggy area was put in during the winter of 1975 when crews had to get in heavy equipment to remove diseased American Elms. 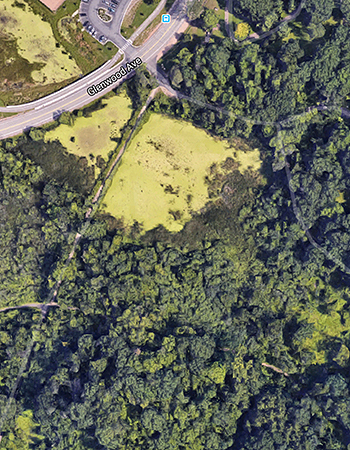 The northern meadow, site of the old Lily Pond, is now bisected by the gravel path covering the large water diversion pipeline from Bassett's Creek to Brownie Lake. Photo courtesy Google. That gravel path in the early years could get very soggy during spring melt. In more recent years it has been built up a little better. 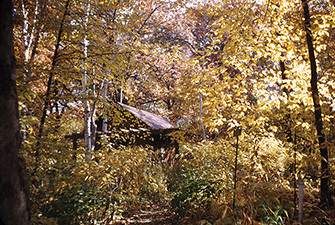 The Garden Office among the fall colors, photographed on October 15, 1950 by Martha Crone. Click on image for a larger version. It is not known what chemical Martha was using, whether it was DDT or something else, but it would just a few years before “Silent Spring” was published. By the end of the season she had added 880 plants to the Garden. That included 348 ferns, of which 308 went to the new Fern Glen. The other 40 were 15 Walking Fern that were planted elsewhere due to their special habitat needs and 25 Common Polypody that were planted around the 1917 Birdbath. On Nov. 6, her last log entry, she noted the Norway Maple had turned yellow and was shedding leaves (1). She had planted the tree in 1949. (2). Annual Reports of the Garden Curator to the Board of Park Commissioners. (3). Martha Crone records at Minnesota Historical Society. Photo top of page: The wetland in Winter, photo by Martha Crone on Nov. 8, 1951. Printable PDF file of this page. - Our Native Plant Reserve - Short document on the origins of the Garden. - Eloise Butler's writings, a selection of essays written by Eloise Butler on the early Garden years. Martha Crone's Annual Report to the Board of Park Commissioners dated Feb. 8, 1958 to Superintendent Charles E. Doell. Martha Crone's Garden Log and her 1951 Census of plants in the Garden. Various papers and correspondence of Eloise Butler and Martha Crone in the collection of the Minnesota Historical Society. Photos by Martha Crone are from her collection of Kodachromes that was given to the Friends by her daughter Janet following Martha's death in 1989. Meeting Minutes and correspondence of The Friends of the Wild Flower Garden. Vol. 5, # 1, January 1957, Martha Crone, Editor. Vol. 5, # 2, April 1957, Martha Crone, Editor. Vol. 5, # 3, July 1957, Martha Crone, Editor. Vol. 5, # 4, October 1957, Martha Crone, Editor. Historical Climatology of Minneapolis-St. Paul Area by Charles Fisk.